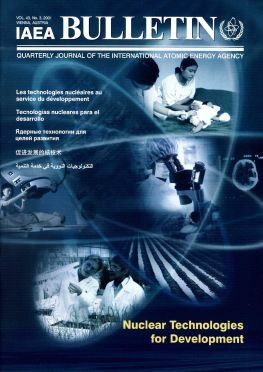 The September 2001 IAEA Bulletin edition focuses on how nuclear technologies can fight poverty and foster development. The IAEA has partnerships in least developed countries (LDCs). Together with other UN agencies, it has developed programmes to deal with arsenic-contaminated water in Bangladesh. Featured articles also examine the role of nuclear technologies in sustainable development, and report on nuclear and isotope techniques used for nutrition and ‘biosaline’ agriculture. The IAEA’s International Project on Innovative Nuclear Reactors and Fuel Cycles (INPRO) is moving into its first phase.